Tamaño de esta previsualización PNG del archivo SVG: 500 × 400 píxeles. Otras resoluciones: 300 × 240 píxeles · 600 × 480 píxeles · 750 × 600 píxeles · 960 × 768 píxeles · 1280 × 1024 píxeles. 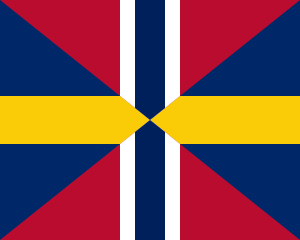 English: Naval jack for the union between Sweden and Norway, as well as the diplomatic flag of the union with the proportions 5:4.